Been gone for almost 2 years and things have changed a lot since then. Not sure I want to get back into blogging yet...but I have started to sew and it feels odd not to have somewhere to share what I'm working on with my sewing pals.....more to come later. I've been working on me.....104 pounds gone and a few more left to get rid of before I'm done.....size 24 to size 8-10 depending on the clothes maker. Nice to see what everyone is up to these days. 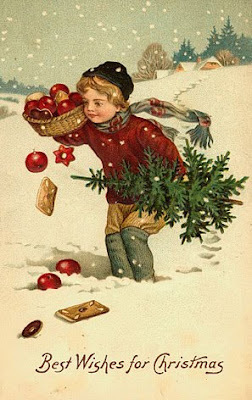 Happy almost December everyone! 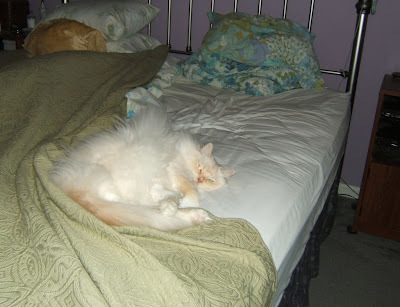 Don't faint at the sight of a new blog post now...I'm just here to leave a short message in case anyone stops by and wonders what's up. 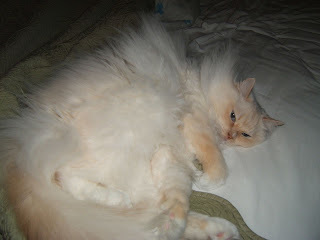 I'm doing fine, having a blast with some things and really not in the mood to blog at the moment. So rather than take the whole thing down, I'll just say that my blog is on indefinite hiatus at the moment....to return at a later unspecified date. Hope you all have a wonderful Christmas and New Year's holiday season! Have a safe and goulish time tonight!!! Well did you think I was never coming back? I haven't really been on the computer a whole lot these last few weeks and no worries...it's perfectly fine by me! Life ebbs and flows and sometimes you just take breaks from things. 3 1/2 years of blogging is a long time with no break, so maybe I was due. Honestly, I'm just great... happy as a clam! I'm focusing on some other things at the moment and enjoying other pursuits. I'm sure I'll get back to quilting one of these days. Computer time has almost been nil since typing is the worst thing for the forearm tendons and they are still quite vocal about getting used at all! So what have I been doing? Well every night I try my hand at a little stitching. Had to pop out yesterday to the Fresh Market to pick up some stuff and a big 'ole piece of salmon. Does anyone else have one of these stores? I love Trader Joe's but that fresh meat counter is just fabulous. I mean anything you want they have! Shame we don't eat any other meat but salmon. 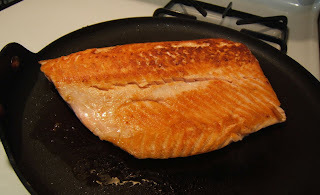 I know lots of people don't like salmon but man o man...is there anything prettier than that beautiful colored jewel getting all lovely on the pan? Honestly..a hot pad and a fork and I could eat right off the pan until I was sick! But I don't. I'm a good girl. I cut it into pieces and store the whole thing in the fridge. That way we grab a slice or two and pop them in the microwave whenever we want some all week. Plus do you know how good this is for your cholesterol? V-e-r-y very good! I found a new FREE bom the other day that I thought I would share in case you missed it over at Sentimental Stitches. It's called Beyond the Cherry Trees. A fabulous antique quilt that she is drafting. Note that the first block is supposed to be all red flowers. 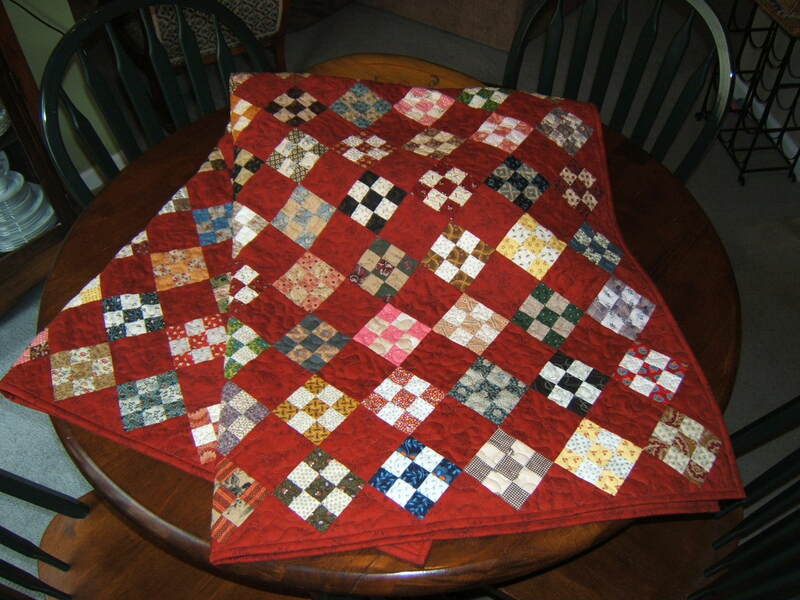 If you look closely you'll see that the red disintegrated as old quilt reds often did from that era. I'm not starting this quilt at the moment, but I'm saving those patterns. They won't be free forever too, so if you want them go now. Before I head out again, I'll leave you with my little goober-head! 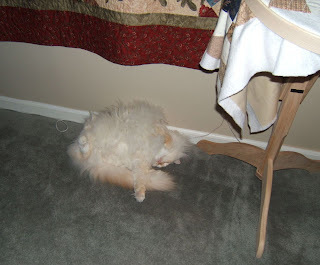 He can get as comtfy as possible with ease, can't he? I almost got his picture with both hands above his head but the shutter sound pulled that top arm in and he woke up. He's still cute as a bug. Oh and see that hoop? I've plugging away at that too! Every so often I take a few rows here and there and one day it will be finished too! I'm sorry that I haven't gotten around to too many blogs in the last few weeks. I do try to read your posts in blogger every week, but haven't really spent the time to comment. Typing is the one thing that sends the muscles reeling. So I avoid it if I can. 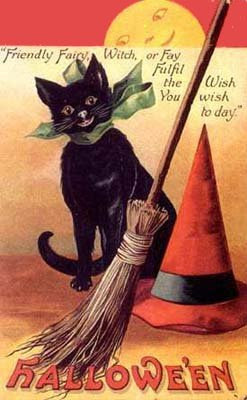 Have a great Halloween if I don't see you before then! I'm amazed at how quickly time seems to slip by these days, aren't you? It never went this fast when I was younger. Where the heck did September go? Now it's October 5th! Now don't fall over, but I have done some SEWING!! Real sewing, yes I have! 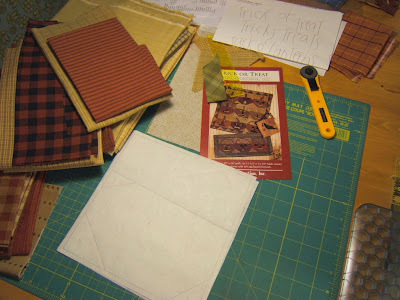 I finally got inspired to start Cheri's Trick or Treat Halloween quilt that I said I'd have done before October...better late than never. 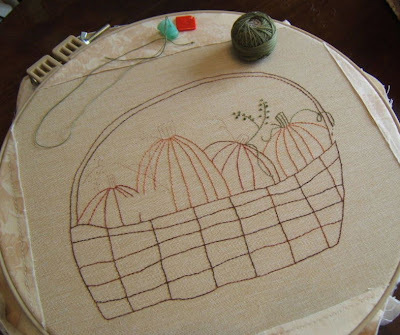 I have 4 of the pumpkin backs done and hope to get the last 5 done today as they take almost no time at all to do. Especially with the FPP technique...flip, sew, flip, sew, peel off! Now, I want to share a...*recipe* with you. See, I am a salad snob! I can eat them at restaurants, Sonic, even the grocery store salad bar...but never at home! 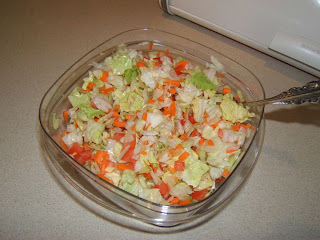 I hate salads made at home. I've tried but something is different and I can't figure it out. But this technique... It's not so much a recipe as it is a technique..... really enabled me to eat salads at home for the first time in years!! I read this on some body's blog and if ANYONE knows who, please share so I can give her ALL the credit. Here's what you do. Put in your bowl and get the carrots. I save myself the steps and go for the shoestring carrots. Do a few more chops and they end up in little pieces. Then move to the tomatoes. I use Roma tomatoes and scoop out all the seeds and wet stuff. It just makes a mess and the meaty part stays firm better. 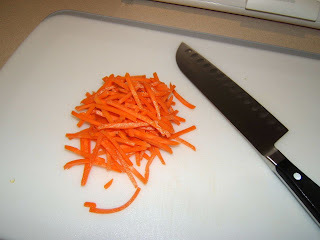 I chop it to about the same size as the carrotts...1/4 inch size or so. I'm done at this point! It has all I need. But you can add green peppers, mushrooms, cucumbers. 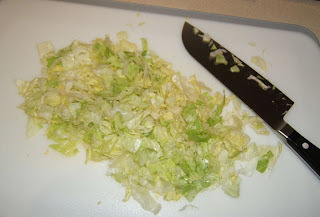 Anything you want, just chop it into tiny pieces. I'd watch the liquidy stuff if you expect it to last for a few days though. Mix it all up and I am one happy camper! I can spoon some into a bowl and have salad at home! At home!! Never before have I liked it, but this is great. It's also super easy to go with less salad dressing this way too. Just toss and toss and it gets covered well. I make this full bowl and it last me 4 meals. 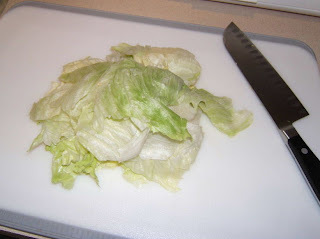 **I will warn you that the next time you open the lid, you might think the lettuce has turned brown...it hasn't. 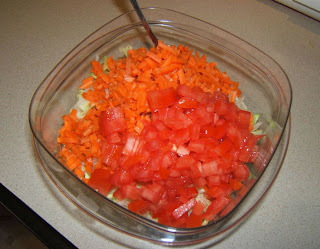 All that carrot makes the cut lettuce edges turn orange, but it's perfectly fresh. Heck carrots turn everything orange. I don't remember where I read this, but I really thank this person who wrote it on her blog! She is a doll and please let me know who she is, if you recognize her recipe! Now I'm gonna go back to sewing! Hope to have something to actually show soon that deals with quilting!! Sorry ladies...here's the link! It's working below too now. Sometimes if it's off you can look at the address in the little line on the top of the screen and see what the problem is. I just had one too many http// 's at the beginning! Yea, right. You wouldn't move him either! How does their fur know how long to be? It is so weird that one row can be an inch and the next part 6 inches!! I'm really working to switch my frame of mine from every blog post being about "here's what I did" and "here's the next step!" to more of a "hey how ya doing, this is what I have to talk about today"...subject based posts. Jan just made a post exactly stating how I felt and what I'm trying to get accustomed to doing. I used to do it but it will take some time to revert, but I'll get there. Plus I'm lacking a few things others have. I can't walk outside and photgraph the backyard and outdoors...don't have one.Condo, remember. I also have to admit we are homebodys. We like it! We don't go out too many places....fairs, shows, stuff like that. We love being here together.